Monitoring your tire pressure is a smart thing. Several different studies provide data that show at least a quarter of all cars on the road have at least one tire that is 25% under inflated. This under-inflation can reduce tread life by up to 5,400 miles. What's worse is that while these under-inflated tires are prematurely wearing out, they are also simultaneously increasing fuel consumption by 2.3%. By monitoring tire pressure and keeping your tires properly inflated, you are saving money in multiple ways. Perhaps more important than saving money, monitoring tire pressure can possible save lives. Getting into a car that has a nearly flat tire could be catastrophic. Likewise, driving down the highway with a tire that is losing pressure could be a recipe for disaster. The stats show that nearly 80,000 crashes a year in the US occur due to flat tires or blowouts, causing a little over 400 deaths. FOBO's tire pressure monitor system is comprised of small valve cap sensors that screw onto each tire valve stem, replacing the existing valve caps. Each FOBO sensor weighs 10 grams and has a Bluetooth radio in it that sends the tire pressure and temperature to an in-car display unit and also to an iOS or Android smartphone. Using Bluetooth 4.0, the sensors should have an unobstructed signal range of somewhere near 100 feet. Each sensor contains a CR2032 battery. The batteries should last up to two years and are easily replaced when necessary. They are fairly common batteries and can be purchased relatively inexpensively online or at brick and mortar stores. 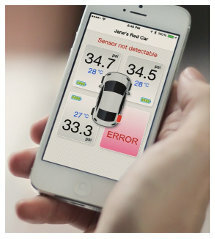 FOBO provides a smartphone app that displays each tire's information (pressure and temperature) on your smartphone. The app has been designed to monitor up to 20 cars, so if you have a small fleet of cars in your driveway, you should be in luck. They also allowed for multiple people to monitor the same car. If you have a family car that is driven by multiple people, each can install the app on their phone and monitor the same car and tires. 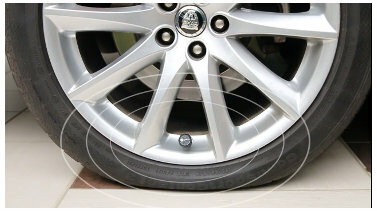 Each of the tire sensors has a built-in theft deterrent that disables them from being reused if they are stolen. The sensors have a unique code in them and are keyed to each user's account and can only be used on that particular account. In addition, the sensors will come with lock nuts and a special wrench that is designed to lock or remove the sensors as needed. The FOBO TPMS is currently available via IndieGoGo for $90. This includes 4 tire sensors, the in-car unit and the locknuts and wrench.